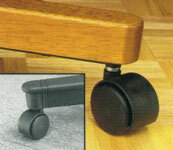 Safety chair caster with an internal brake allows smooth effortless chair rolling while seated. Minimizes chair movement when no weight is applied. 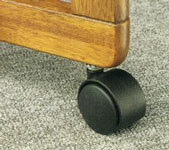 Safety Casters with external brake Prevents wheels from turning freely when the user is seated. Wizard's bottom line is safety! "An ounce of prevention is worth a pound of use." Safety casters have been ergonomically designed to reduce such risks to worker health and safety. Built for quality and durability, casters are safety essentials. Important: for uniform caster wear and balanced safe rolling, we recommend replacing all casters at the same time. Features an internal brake which prevents wheels from rolling freely when the user stands up. Allows smooth effortless chair rolling while seated. Minimizes chair movement when no weight is applied. Casters feature 2" diameter wheels and full hoods. Weight rating: 125 lbs. per caster. Color: Matte Black. Available with hard or soft wheels. 10mm 7/16" 7/16" 5/16" 3/8 7/16" 3/8" 7/16" 3/8" 7/16" 5/16" 1/4" 3/8" 3/8"